If you elect to mulch every year, it is possible that your planting beds and the plant material that is contained in these areas could benefit from a mulch cultivation service. While mulching every year provides your property with a fresh appearance, it also might not be allowing your mulch to decompose as quickly as possible. Planting beds should never have more than 4" depth of mulch accumulated in a growing season. Too much mulch does not allow for proper water consumption and can overheat the planting material (the exact opposite of mulch's benefits). Additionally, mulch that has "hardened", or not been able to decompose, creates an additional barrier for water to penetrate down to the root base of the plant material. By use of machine (tiller) and hand methods (rake), the existing mulch is "cultivated" to break up any existing compaction and rejuvenate the organic matter that exists in the mulch. Aesthetically, it will also bring the natural color back to the mulch creating an appearance of a freshly installed mulch application. 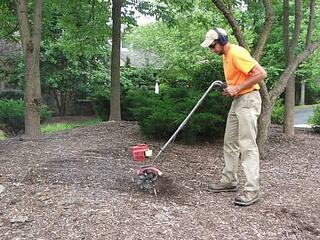 This service is also beneficial if you elect to mulch every other year. Cultivation will freshen up the overall appearance of the planting beds and typically costs about 35% - 40% less than a standard mulch application to your property.While every property is unique and circumstances differ, mulch cultivation should be used as part of an overall mulching plan and not a long term solution to never mulching. Mulch cultivation should, however, be used as part of a systematic solution over a period of time to improve plant quality and reduce the frequency or need of mulching every season. Your Turfscape Account Manager can help develop a long-term mulching plan for your property that will ensure your plant material investment stays healthy while helping reduce your overall mulching budget. Our recommended time of year to do mulch cultivation is early-spring to late-fall.